College of DuPage Nursing Student Lisa McArthur shared that acne is a common skin disease that is caused by a combination of factors including inflammation and excessive sebum (oil) production. Most people at one point or another have either experienced acne themselves or known someone who has been affected. Acne is most common in adolescents and young adults, however adult acne is also found in approximately 50% of adults. Tea tree oil is derived from the leaves of the tea tree, its value in fighting acne is due to its antimicrobial and anti-inflammatory effects. A study published in the Australian Journal of Dermatology, by Jenny Tu and colleges, in 2017 concluded that the use of tea tree oil products significantly improved mild to moderate acne and that the product was well tolerated in a group of 12 participants. These participants applied tea tree products to the face twice daily for 12 weeks. It showed that over the course of the 12 weeks the participants had a decrease in the number of lesions, with only a few reporting side effects such as dryness, redness, or itching and the application site. 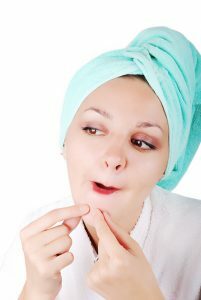 For mild to moderate acne, it has been found that applying 5% tea tree oil gel is as effective as 5% benzoyl peroxide. Although the beneficial effects of tea tree oil take longer to become evident than with benzoyl peroxide, it seems to be less irritating to the skin. When tea tree oil is applied twice daily for 45 days, tea tree oil reduces several acne symptoms, including acne severity. Other uses for tea tree oil include fungal infections of the nails, athletes foot, dandruff, cold sores, and lice to list a few of many. Before using any herbal supplement it is important to consult with your physician to make sure it is safe. You should also do research about supplements on your own to learn about their uses and warnings. Tea tree oil is likely unsafe when taken by mouth, therefore it should be used topically only. There are no known drug interactions with tea tree oil. It is not advised for anyone to apply pure undiluted tea tree to their skin. Instead, the oil should be diluted in a mixture of coconut oil, Aloe Vera gel, water, or, olive oil. Too potent of an oil could cause excessive skin dryness or irritation. To make the solution you would put only two drops of the tea tree oil in 2 teaspoons of the coconut oil. The use of essential oils and herbal supplements is becoming more and more popular every day. In many cases, herbal supplements and essential oils can be beneficial but need to be done under the supervision of your physician.